food intake | O’HARA & CO.,LTD. This is for measuring 3 kinds of amounts: 1 ambulatory activity, 2 food intake and 3 water intake, at the same time within one cage. So not only each amount, but also possible to search correlation of data sets. 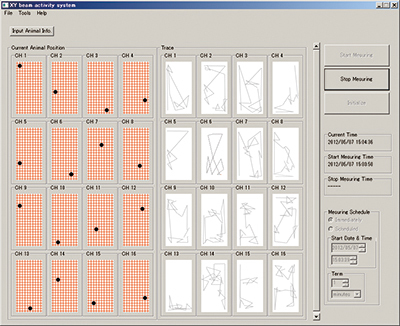 It is possible to measure at the same time such amount within 16 cages at the maximum (16 individuals) by means of a computer. By using plastic resin cages available on the market, it will be possible to autoclave and the replacement of the cage itself is reasonable. All the parts that come in contact with animals such as food box, watering bottles are autoclavable. 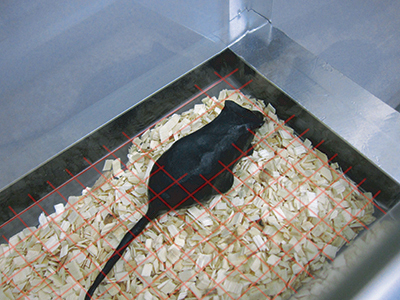 For measuring activity, the position of the target is detected by interrupting the infrared beams positioned in the X and Y axis around the cage. This device detects the movement in position of the whole body of the target animal, without being misled by the movement of the tail and any other body. The position and movement of the target within the cage are automatically measured. The position and movement data are stored on a hard disk as time series text files. In the system, the food box and the water intake bottle hang respectively from the precision scales. 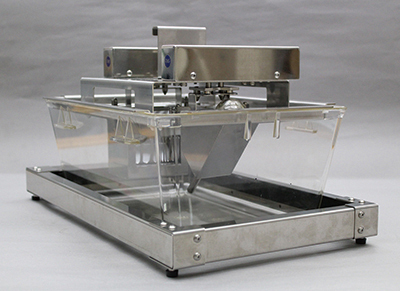 The food and water intake are measured by the unit of 10mg, by a measuring unit mounted on cage top. The food box and the water bottle can be easily approached by the target animals. The food box can recover the remnants of food that remains after each bite. The water bottle is also designed to measure the water intake while it is hanging from the cage top. The water bottle eliminates almost all possible leakage and evaporation of water and enables to measure correctly the water intake. 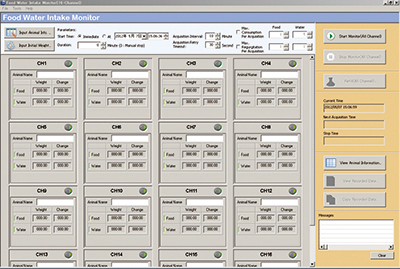 The software includes refill icon so that food and water may be supplemented during the measurement. This entry was posted in Products and tagged amount of activity, biological rhythm, food intake, water intake on 7月 23, 2015 by admin.